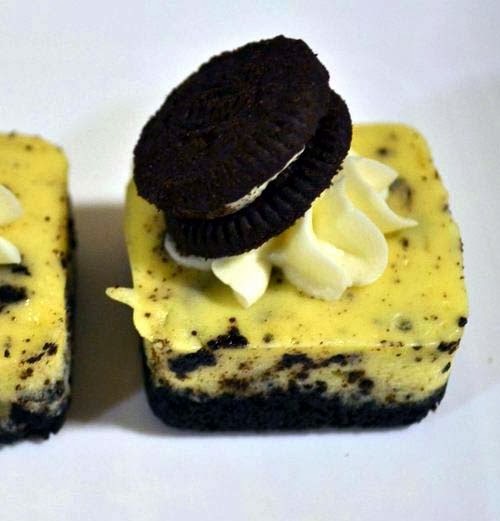 This delicious Oreo treat is adapted from CopyKat Recipes. Yummy stuff! Please note: this recipe tastes best when you allow it to rest for 24 hours before serving. It isn't necessary, but a suggestion for optimal flavor. Mix melted butter with Oreo crumbs and press in spring pan cover the bottom and 1 1/2" up the sides with crumbs, set aside. All Ingredients need to be at room temperature before beginning. Beat cream cheese until light and fluffy (You can add the 1 cup of butter as listed as an optional ingredient). Keep mixer on a low setting during the mixing and beating process. Add sugar gradually and continue beating cream cheese until mixed through. Add eggs one at a time and continue to beat until blended. Measure the vanilla, salt and flour, pour into the cream cheese and egg mixture and beat until smooth. Add the sour cream and beat well. Turn off the mixer and stir in the coarsely chopped Oreo cookies with a spoon. Pour cream cheese into the spring form pan and place the nine coarsely chopped Oreo Cookies on top of the cream mixture. Place pan on the top rack and in the middle of a preheated oven at 325 degrees and bake for one hour. The cheesecake will be done when it jiggles slightly in the middle when the pan is gently shaken. If the cheesecake is very jiggily, then cook for an additional 15 minutes. When time is up prop the oven door open and let the cheese cake stay in the oven for one hour. Remove from oven and let cool enough to place in the refrigerator for 24 hours. It is worth the anticipation. A cheese cake should season. The flavor ripens and becomes enriched. The cheesecake was baked on a 13x9 pan (i.e. nonstick bakeware) and cut into bite-sized squares. Each square is then topped with whipped cream and a mini-Oreo cookie. For more Oreo treats, see Oreo chocolate chip cookies.